2018 Holiday Gift Guide: All the Gear They Could Ever Want! Have the holidays snuck up on you? If you’re quietly freaking out about what to get all the people on your list, we’ve got you covered. Everything can be ordered from the comfort of your home, and we’ve found something for everyone on your list in every price. So check these items out, and enter our giveaway at the end! Power strips and surge protectors may not be exciting or attention-grabbing, but they are a reality of modern life. With so many devices that need to be plugged in, there’s no way anyone’s home or office can get by without having at least one or to of them. But despite their importance, their design hasn’t really changed. 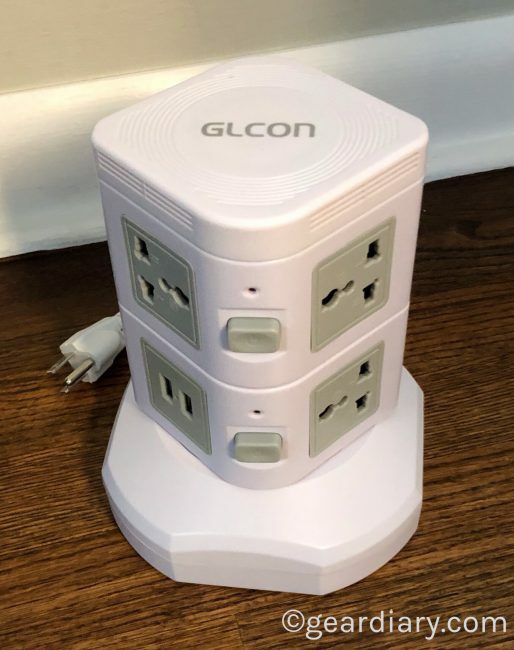 The $34.99 GLCON Power Strip Wireless Charger Tower changes all that. Rather than a long strip of outlets and USB ports, their offering is a “tower of power” that can deliver up to 3000W of juice. It has 4 USB ports that can deliver up to 2.1A each, a variety of wall outlets that accept both US and European plugs, a flat top that delivers Qi wireless charging of up to 10W and a retractable cord. It’s not a traditional power strip; it’s a universal multi-functional charging station that integrates a power strip, surge protector, USB Hub, and fast wireless charger. Upgrade your loved one’s tool chest by giving them something they’ll be thrilled to receive! 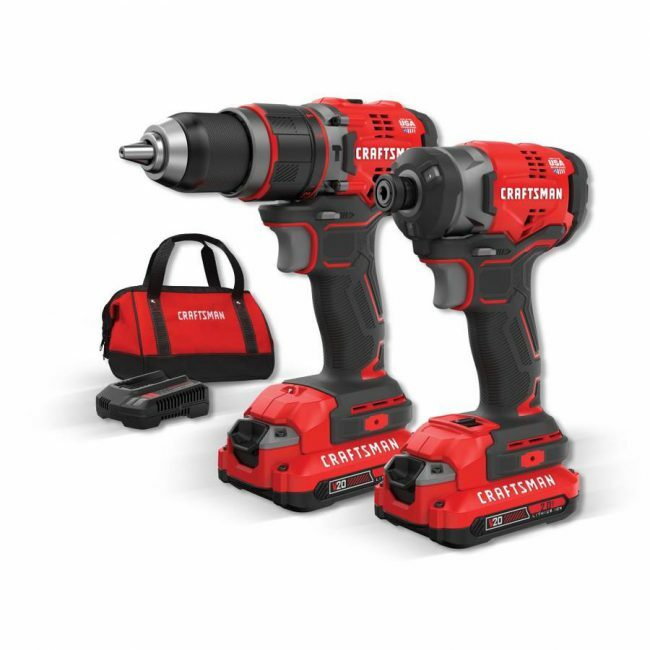 The $249 Craftsman V20 2-Tool Brushless Cordless Combo Kit can handle all of their drilling and fastening needs. The kit includes a 1/2″ brushless hammer drill that is powerful enough to handle wood and concrete with ease. The brushless 1/4″ impact driver “has a MAX torque rating of 1,700 in-lbs for speed and ease of driving large fasteners.” The kit includes both tools as well as two 2 Ah batteries, a charger, and a carrying case. Both of the devices are light, compact, and they have very comfortable molded grips to help with fatigue. Your handy-person will no longer need to stop what they are doing to switch bits, and they’ll thank you because the tools are powerful and the batteries are long-lasting. Both devices are proudly made in the USA with global materials. You like to be cool when you sleep, but your partner never seems to get warm enough; sound familiar? The BedJet is the answer. Give your partner this, and both of you will be guaranteed a comfortable night’s sleep every night. BedJet doesn’t change the feel of your mattress; it doesn’t add a mattress topper or pad, and there are no wires or tubes that you’ll have to get used to sleeping on. Even so, the BedJet is able to cool your bed off nearly instantly, or it can make your bed toasty warm in just a few minutes. Even better, the BedJet will eliminate body moisture, so there won’t be any nasty dampness from night sweats! “BedJet is instant relief for hot sleepers, night sweats, evening hot flashes, cold feet and cold legs, cold winter sheet shock and memory foam mattresses that trap heat.” Of course, it’s app-controlled, so you can personalize your comfort level to make your bed your haven. A single zone BedJet that will work with any size bed is $339, and a dual-zone for a queen-size bed is $809. Both of you deserve to have a comfortable, good night’s sleep — the BedJet will help you have that. Happy Holidays to both of you! The $299.99 Aiwa Exos-9 Bluetooth Speaker is a large portable speaker that offers huge sound and long battery life. Perfect for tailgating, parties on the patio, and grilling at the park, the Exos-9 can turn any event into something spectacular. The speaker features 200 watts of continuous power with 5 drivers, including a 6.5″ dual-voice coil subwoofer, and it even has a swappable battery pack for those times when you just need to keep going. It has a handle on top so you can get it where you need it to be, and you can even link two together for a bigger sound. 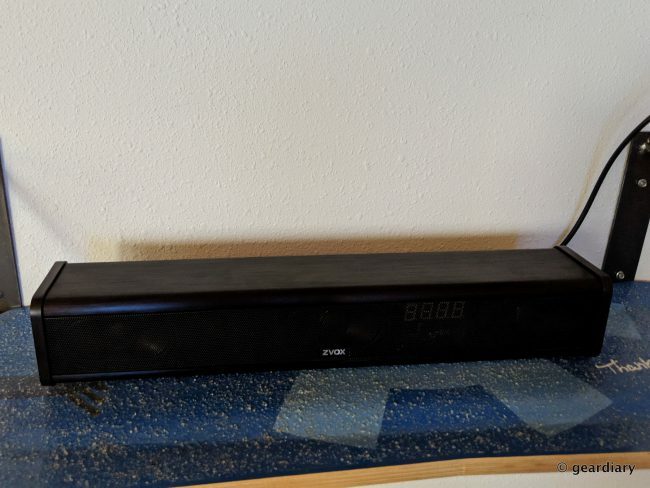 A five band graphic equalizer with four presets makes sure the sound is as you like it, and you can get up to 50 feet away from the speaker and still have a Bluetooth connections. It also uses NFC and comes with an aux-in, so you can conveniently connect to almost any device. There’s even an extended 18-hour battery pack available if you need a longer-lasting battery. 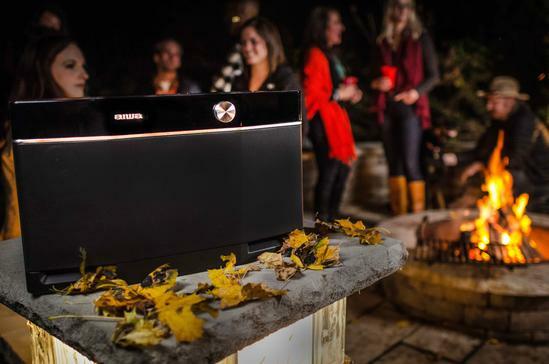 Celebrate your life outdoors with a speaker that turns every event into a party! If you’re totally stumped about what to give someone, their favorite music is always a safe bet, and their favorite music is all on Spotify! You can give someone a Spotify gift card good for one month ($9.99), three months ($29.97), six months ($59.94), or a year ($119.88). If you want something for your own family, you can sign up for Spotify Premium for Family; it costs $14.99 per month and you can add up to six family members to your account. If you sign up before December 31st, Spotify will give you a Google Home Mini voice speaker as part of their plan. If you love the idea of smarthome mood lighting, but the price tag on so many of the lighting options seems a bit too rich for your blood, Monster IlluminEssence may be just what you’ve been waiting for. Monster IlluminEssence is “an easy-to-use color-changing LED Lighting System that makes the fun and excitement of professional quality LED lighting significantly more affordable than ever before.” If you want mood lighting for parties or your holiday decorating, this is a great option. There are no complicated devices or software set-up; IlluminEssence uses a “simple RF touch remote system that works right of the box.” The system is totally modular, so you can make it work in any size room; each kit includes a different combination of LED color-changing bulbs and LED strips so you can customize your room exactly how you’d like. “Simply screw in the bulb to any light fixture, remove the adhesive on the LED strip and stick it below your bed, bar, kitchen cabinetry, or anywhere you want to add instant mood and ambiance.” Monster IlluminEssence will be available at Walmart. 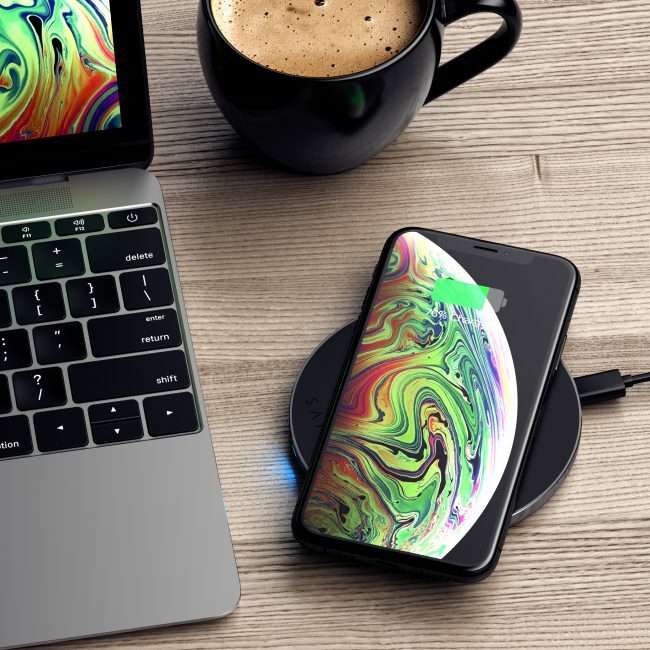 Satechi has your gift recipient’s Qi-Wireless charging needs covered with their new $44.99 Aluminum Type-C PD & QC Wireless Charger; it is capable of speeding charges up to 10W on compatible devices. It delivers a max output of 7.5W to Qi-enabled Apple devices and 10W to Qi-enabled Android devices. Over-temperature protection and foreign object detection (FOD) protects smartphones against temperature spikes, and an integrated LED indicates when a device is charging, fully charged, over-temperature or experiencing a malfunction. The Satechi Type-C PD & QC Wireless Charger even comes in silver and space gray so you can perfectly compliment most laptops. If you’re looking for a speaker system that creates wall-shaking explosions in heart-stopping 3D surround sound, then the $269.99 ZVOX AccuVoice AV203 TV Speaker isn’t it. But if you want to be able to hear and understand what people are saying on your favorite TV shows and movies — without having to turn your television’s volume up to 80 or rely on sometimes inaccurate or incomplete (and always distracting) closed captioning — the ZVOX can definitely help. By using “proprietary digital algorithms that separate the voices from the rest of the soundtrack – and then manipulating them much like a hearing aid does,” the AV203 soundbar cases voices to “jump out” so you can hear them clearly. 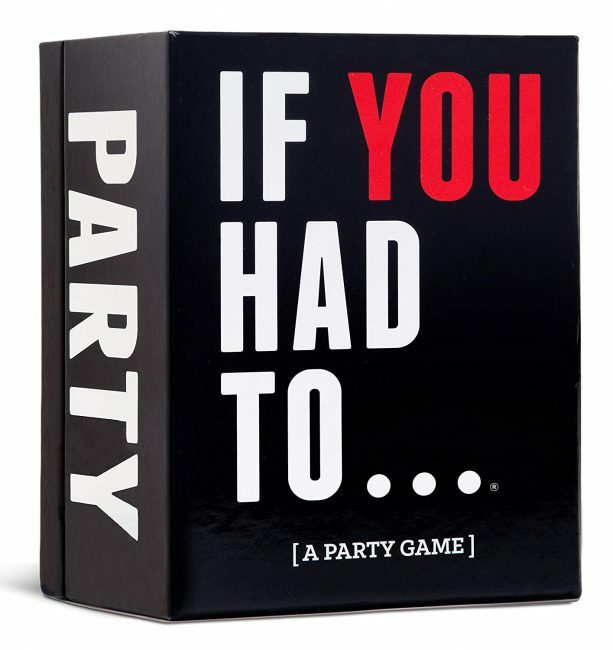 This is the perfect gift for anyone who sometimes has trouble hearing what people are saying with all the background noise on the shows they watch. The holidays can be hard if you’ve lost someone you love. That’s why this item seemed so interesting to me. 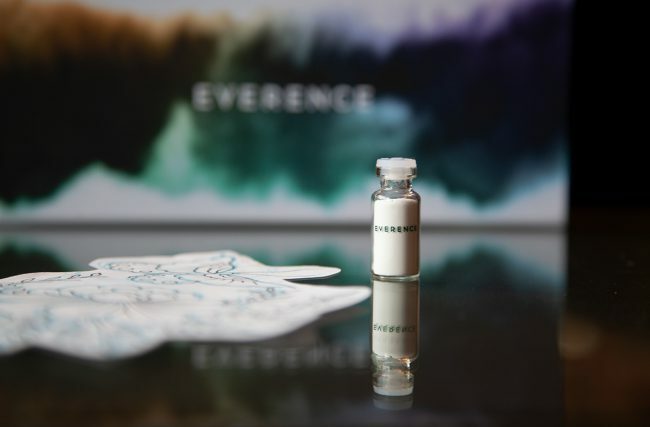 Everence has developed a “technology that allows human DNA, human/pet hair or cremains to be incorporated into tattoo ink. It was developed by leading scientists at Brown and Duke Universities, and it is made from medical-grade materials and is held to the strictest quality control and safety standards in the world.” If you’re interested in a non-traditional present, and you like tattoos, then you might consider Everence’s easy-step collection kit. With it, users can “create an ever-lasting tribute with a swab of the cheek or a few strands of hair. 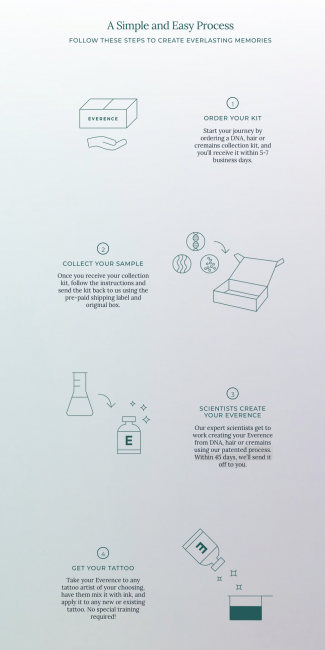 Everence allows users to “keep a piece of their family close, remember a loved one or include their favorite family pet into a piece of art on their body.” Everence’s collection kit begins at $350.00. If you, or someone you love, has lost someone near and dear, this might be the perfect gift. You can get 20% off your order with the code NOW20, and if you enter the code THANKS30 on Black Friday or Cyber Monday, you will get 30% off. Can you ever have too much backup power in your bag? No; the answer is always no. The new $199.95 mophie powerstation USB-C 3XL is a 26,000mAh battery “capable of delivering up to 18 hours of extra battery life for the MacBook. 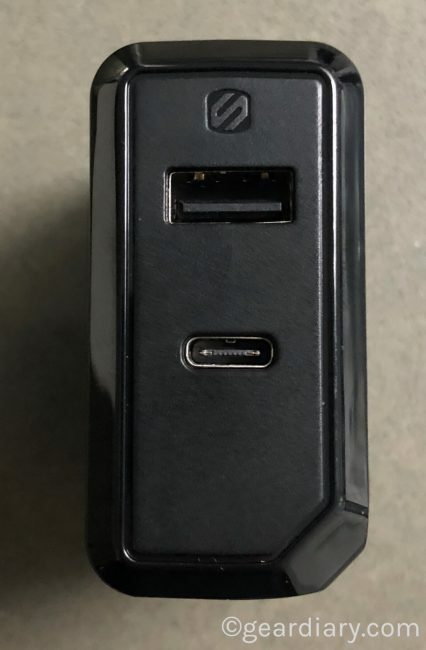 USB-C PD input and output ports deliver fast charging and recharging (up to 45W), while an additional USB-A port can charge a second device simultaneously.” This is a great gift for your favorite traveler; they will never wonder where their next plug-in will happen, and they won’t have to fumble with international chargers while getting to their destination because this battery will last the entire flight even with hellacious delays. Once they get to their hotel, they can top off and be ready for anything during the rest of their trip. The powerstation USB-C XL is one powerful beast, and it would be a very welcome gift for any road warrior. 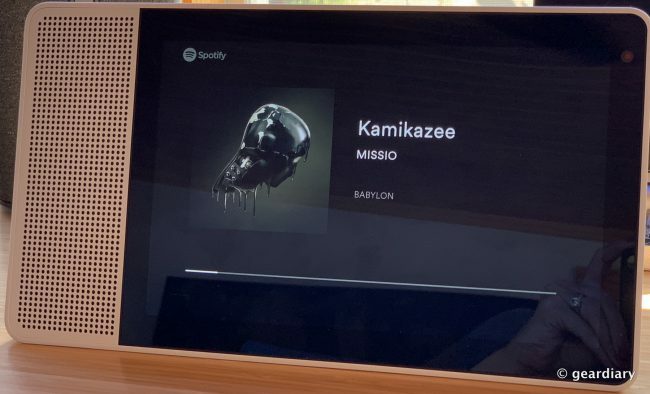 Who wouldn’t like a Lenovo Smart Display as a gift? It’s the perfect Google Home assistant; it can make video calls, show and tell the weather, help with recipes while cooking, and it integrates perfectly with many Google smarthome accessories. And that’s just the beginning of what it can do. Available in an 8″ version for $199.99 and the gorgeous bamboo-backed 10″ version that I reviewed for $249.99, the Lenovo Smart Display puts the world at your gift recipient’s (voice) command. Candles make great gifts and people love getting gifted subscriptions. 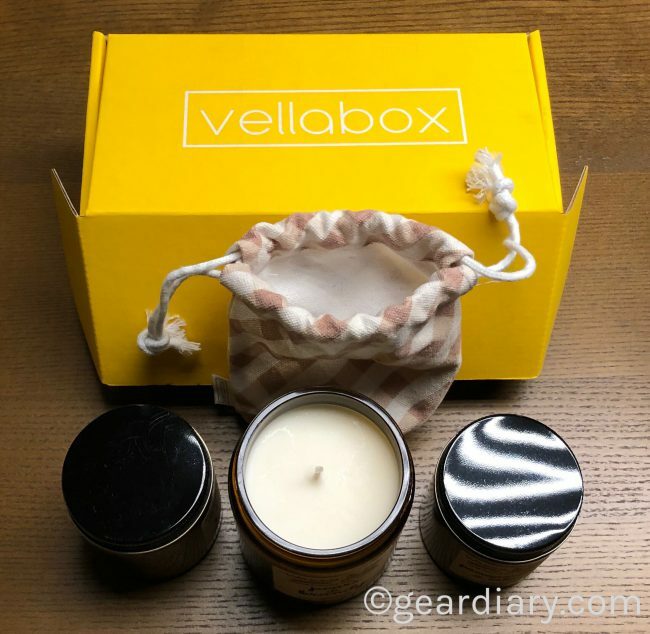 Vellabox put the two together with an artisan candle subscription box that sources candles from artisans from across the U.S. The gift subscriptions start at just $10 a month and max out at just $30 a month. Dan got a sample box so we could decide if we wanted to include Vellabox in this gift guide; he was impressed and, as a result, we’ve included it. Every aspect of this subscription screams class. After opening the shipping box you are presented with a bright, Vellabox gift box. The candles and other items are inside, with the candles safely protected in cloth bags with a pull string. The bags themselves are great for stowing small daily items or for use when packing for a trip. The candles come in a colored glass jar with a lid that easily twists on and off. Dan’s sample included a pomegranate and cider scented candle (he says it smells like a warm fire is burning in the fireplace while you enjoy some cognac) and a pear and brandy scented candle (he says it smells delightful!) The box also included Chai lip balm from All Good which has a nice but subtle scent and offers SPF 15 protection. Candles come in enough fragrances and sizes that there is something for everyone. Even phones with generously sized batteries can sometimes let you down. 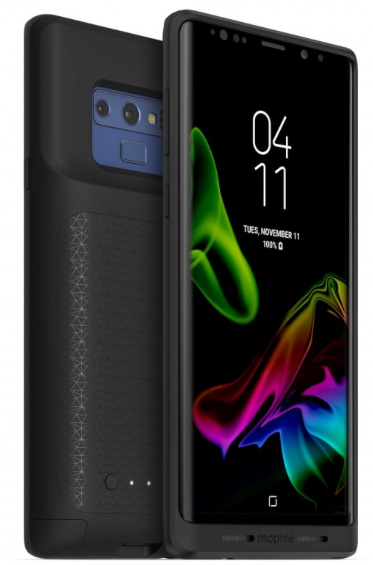 If someone on your gift list has the Samsung Note9, they can totally use the $99.95 mophie juice pack for the Note9. It packs an additional 2,525mAh battery into a slim, low-profile case so that they can recharge on the go. 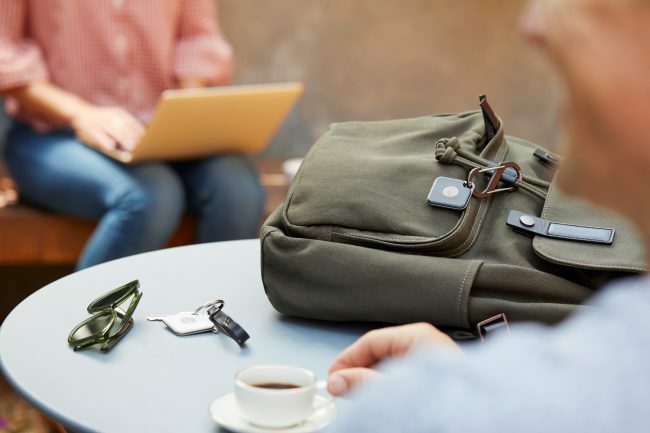 “It provides high-impact protection with internal rubberized support pads that can withstand the toughest drops and falls.” Even better, it’s Qi-compatible, so they can take advantage of fast wireless charging with all Qi wireless charging systems. Protection and extra battery when it’s needed? Perfect. If your loved one is a music fan, but she has to share her space with others, then she likely needs a pair of awesome headphones. There are some great options on the market these days, but if you really want to wow her, check out the $399 Master & Dynamics MW50+. These wireless headphones are an update to the impressive MW50 headphones; the MW50+ are available in black metal with black leather, silver metal with black leather, and silver metal with brown leather. We wouldn’t recommend them if the MW50+ headphones didn’t sound amazing, but they also get great battery life and, best of all, they can be either on-ear or over-the-ear headphones — that’s right, the MW50+ ship with both styles of ear cups. A number of us on Gear Diary have Master & Dynamic headphones, and we can’t say enough good things about them. Give a pair of these to someone you love, and they will be thanking you for years to come. There’s a special you should know bout, too — Master & Dynamic is offering free customization of the MW07 case from December 4th through December 10th; use offer code MND18. Are you a fan of cold brew? If so, you should check out Gourmia’s latest cold brew coffee maker, the GCM6850. The fastest cold brew on the market at its price point (retail is $99.99, but you can find it for much less on Amazon), the coffee maker can get you quality brew in as little as four minutes. 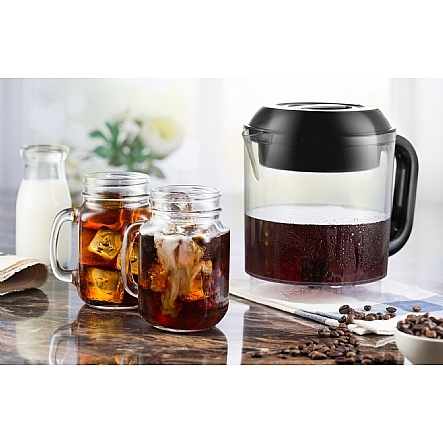 With four modes: light, medium, bold or concentrate, the chill cycle on the Cold Brew coffee maker circulates over ice so you won’t get diluted and bland while dashing to the car. 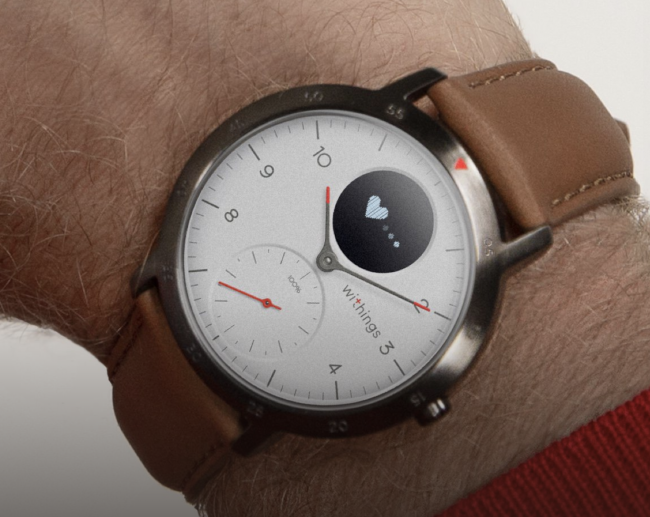 The latest generation Withings Multi-Sport Hybrid Smartwatch is the best yet! 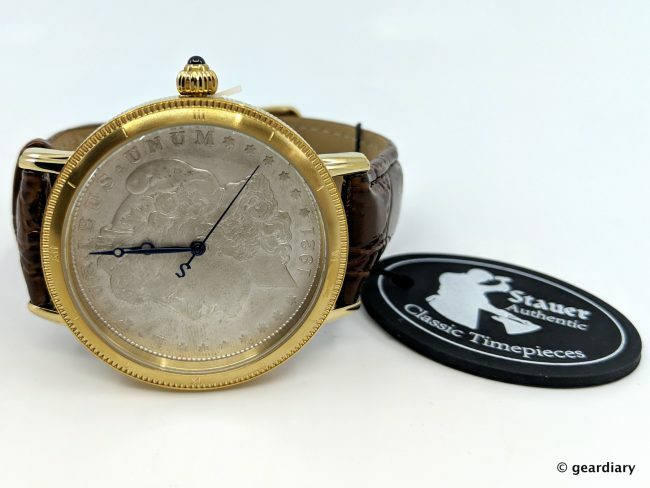 The $199.95 40mm watch looks great on men and women, and it not only tracks steps, distance, and calories, it also tracks sleep and has a silent alarm to help you wake up on time and a sleep score so you can understand the quality as well as the quantity of sleep you’re getting. But that’s not all, folks! The Withings Multi-Sport Hybrid Smartwatch also tracks heartbeats per minute, and it ascertains fitness level via VO2 Max estimation. You can select from 30 activities right from your wrist to launch a workout with monitored heart rate. The watch is connected through your smartphone to GPS, “so you can map your path with pace, distance, and elevation during all your running or biking sessions.” The Multi-Sport is water-resistant to 50m, and it gives notifications for calls, texts, events, and apps. Best of all, it’s rechargeable, and the battery can last up to 25 days on a single charge. 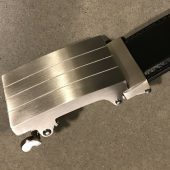 Available with a black or white face, there are also several optional bands to choose from when ordering so that the watch will be personalized to fit the wearer’s personality. There’s nothing better than walking into a room that smells wonderful, am I right? Scent totally sets the mood, whether it’s relaxing or energizing. If your gift recipient lives in an apartment, they might not be able to burn candles for safety reasons. Give 100% pure essential oil scent goodness with the $54 Pure Company Aromatherapy Diffuser Collection which includes an attractive diffuser and three of The Pure Company’s essential oil blends. 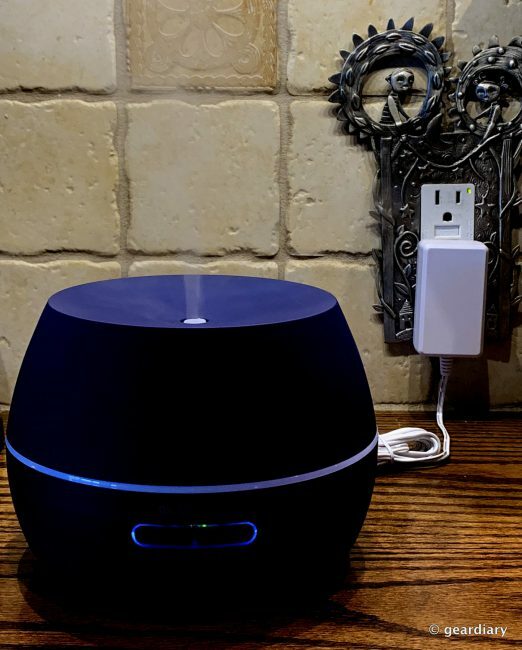 Running this diffuser will contribute to everyone’s relaxation after all of the holiday craziness! Etymotic’s new ER3SE earphones are wired earphones for people who love their music. Etymotic actually released two versions of the ER3 earphones. The ER3SE Studio Edition, “provides a high level of sensitivity, making it a perfect match for the portable media players on the market today. The ER3SE offers audio professional grade sound reproduction at an affordable price.” While the ER3XR Extended Response, “offers a modest bass boost, building on the sound quality of the ER3SE, while providing a slight bass boost for those listeners that prefer a stronger low-end response.” The earphones look the same, but as the descriptions indicate, deliver slightly different experiences. I was sent the ER3SE Studio Edition. We love the fact that, thanks to the three-flanged ear tips, you get a good degree of noise isolation without the need for electronic wizardry and the quiet buzzing that is often part of the Active Noise Cancellation process. 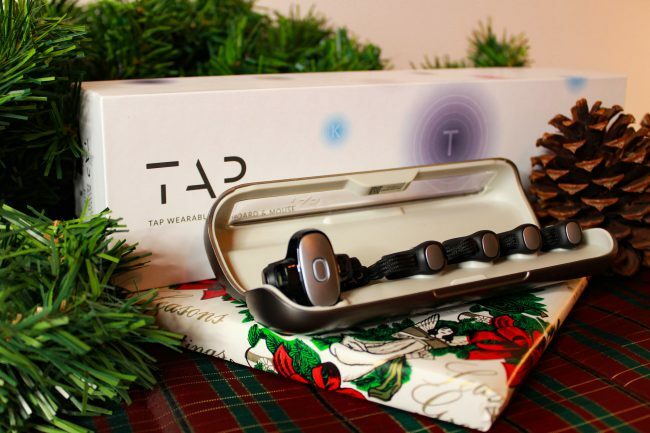 We also love the fact that Etymotic is still creating earphones that focus specifically on the listening experience without trying to be a jack-of-all-trades that handles music, calls and voice commands. The earphones come with extra filters so you can always get them sounding brand new even after months of ear wax building up inside. And thanks to the decision to use a thicker cable, these earphones deliver a more substantial feel that is a bit less prone to being a mess of tangled cable. Most importantly, these $179 earphones deliver a superb listening experience regardless of the style of music you enjoy. We think they sound great! 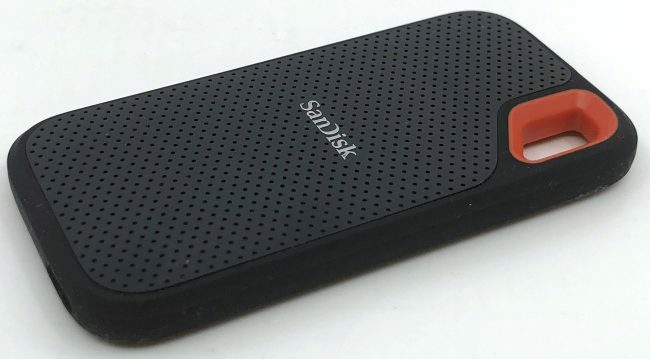 Everyone can use a large capacity portable SSD, and if you want to give one that is small, tough as nails, and fast, then you should check out the SanDisk Extreme Portable SSD. With read speeds up to 550MB/S, rugged IP55 water and dust-resistance, shock and vibration resistance, capacities up to 2TB, it’s great for on-the-go. $99.99 gets you the 250GB version, but you can get much larger at $125.99 for 500GB, $279.99 for 1TB, and $529.99 for 2TB. This is the perfect gift for professionals, entrepreneurs, and anyone else on your gift list. The $37 Dot is a 130 lumens rechargeable flashlight that fits on a keychain. It is not only tiny, measuring just 1.9″ long and just a 0.58″ in diameter, but it’s also rugged and delivers a serious amount of light. It weighs a mere half an ounce. The Dot is machined from 6061 T6 aerospace aluminum and has a look and feel that screams “quality.” Hidden within that aluminum case are premium components including a Cree XPG2 LED light, glass lens, and gold-plated connectors. Yet, despite its small size, it delivers 150 lumens of light. Even though it is tiny in size, the Dot brings a powerful light and rugged housing. Its small size means it fits nicely on a keychain so the person you gift it to will always have a bright light with them when they need it. At $37, you cannot go wrong with this small, bright light. When you go to buy one as a gift for your BFF, we have little doubt you’ll want to order an extra one as a gift to yourself. What’s a home without great audio? 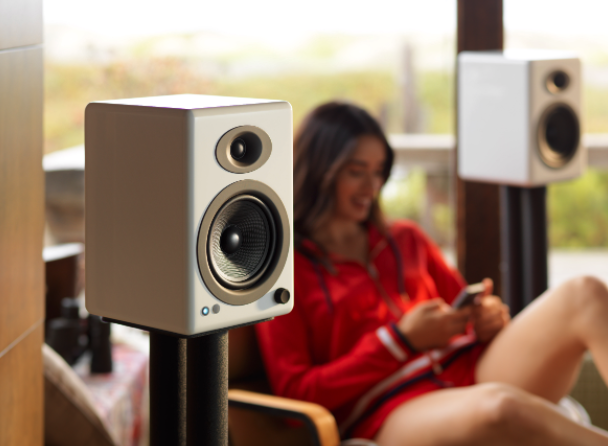 Sure, your loved one probably has a speaker or two in their home already, but we doubt it comes close to the sound and the flexibility the Audioengine A5+ delivers. These speakers are an update to one of the most popular speaker systems from Audioengine, but they take things to new levels with the addition of Bluetooth. That means you can use these powered speakers as you would any pair of wired speakers or you can stream via Bluetooth. That, however, is just the beginning. They have 5” Kevlar woofers, 3/4” silk dome tweeters, a 24-bit high-performance DAC and analog class A/B amplifiers. They sound amazing, can fit just about anywhere, and they get loud enough to fill even large spaces with music. Give these $499 – $569 speakers as a gift, but be warned — when you hear how good they sound, you’ll want your own set! TCL televisions with Roku streaming built into them are the favorite of a number of Gear Diary writers; heck, I’ve bought three of them! The 2018 4K TCL Roku Smart TVs feature Dolby Vision for greater brightness and contrast, and TCL’s Contrast Control Zone technology which “individually optimizes the image across up to 120 zones to yield striking contrast between light and dark areas.” Best of all, the TV’s use Roku OS, which gives users easy access to any attached cable boxes, Blu-ray players, or gaming consoles without having to flip through complicated menus or remembering which special buttons to use. 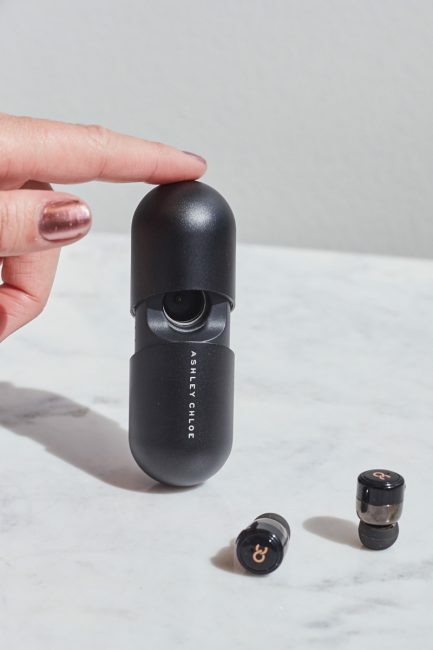 The included remote simply uses your voice to find movie titles, launch or change channels, and even switch inputs; it also has a 3.5mm headphone jack on the side for those times when you want to enjoy the TV without disturbing your housemates. So considerate! 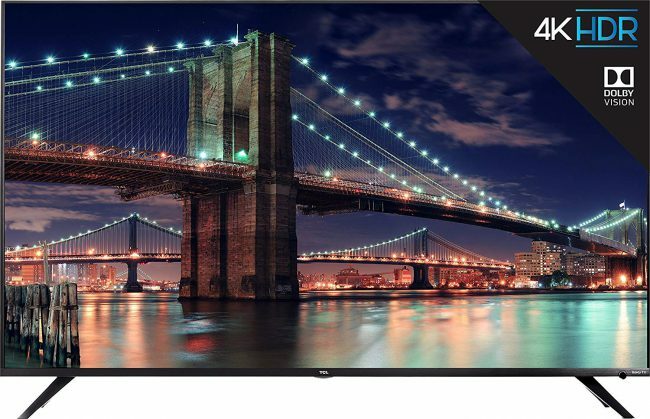 These latest 4K TCL televisions have a fantastic display, but what really makes them special is how affordable they are; this 55″ TCL Smart LED TV is selling for just under $600 — with shipping included if you are an Amazon Prime member. This is a holiday gift that everyone would love to unwrap! The iPhone XS Max is an amazing smartphone and the Nomad Rugged Tri-Folio is a great way to protect it. The design of the Rugged Tri-Folio means you can protect your investment and leave your wallet at home. Instead of a single cover with card slots that you will find with many other folio cases, the Tri-Folio has three parts. There is the section that protects the iPhone. There are also two additional sections with four card slots and two cash slots. 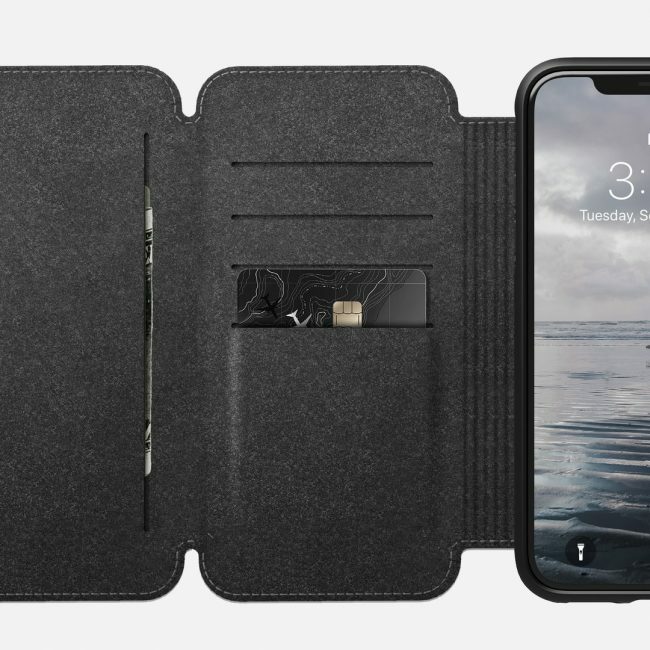 That means the Tri-Folio isn’t just for people who already use a minimalist wallet, but as the company notes, “The new Tri-Folio is designed to completely replace a traditional wallet.” Seriously, this $79.95 case can replace pretty much anyone’s wallet. 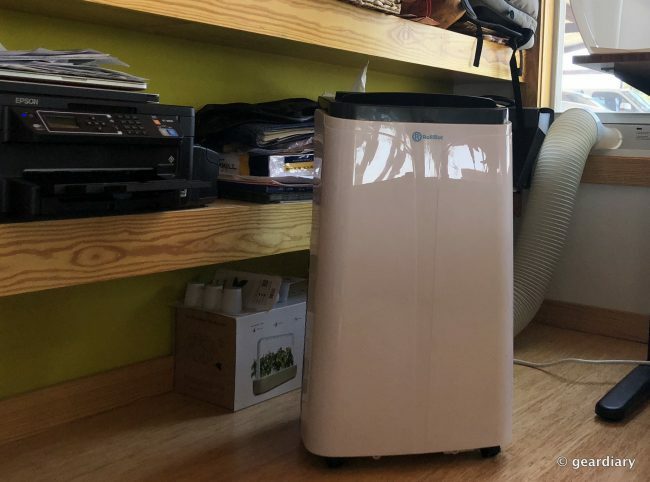 If you’ve got one of those houses with rooms that never seem to get cool enough or warm enough, and your partner is always complaining that they are too hot or too cold, the $529 Rollibot RolliCool 100H Portable AC with Heater is the perfect solution. It’s attractive, easy to set up, and best of all — it’s smart. Whether you’re controlling it through its app on your iOS or Android device or telling Alexa when to turn it on or off or change the temperature, having an independent heating and cooling source in a room that would otherwise be miserable to exist in is ultimately a gift you’re giving yourself because you won’t have to listen to any more complaints. Know what I mean? The Scosche PowerVolt 3.0 is a USB-C and USB-A Fast Charger for home use. This small black box at US 110V prongs that fold into the unit for safekeeping when not in use and flip out so the wall charger is ready for use in seconds. The $34.99 PowerVolt 3.0 has to ports into which you can plug cables you already own. There is an 18W USB-C port that delivers speedy charging to get you up and running quickly. Phones and tablets equipped to handle fast charging can get to 70% capacity in just thirty minutes. 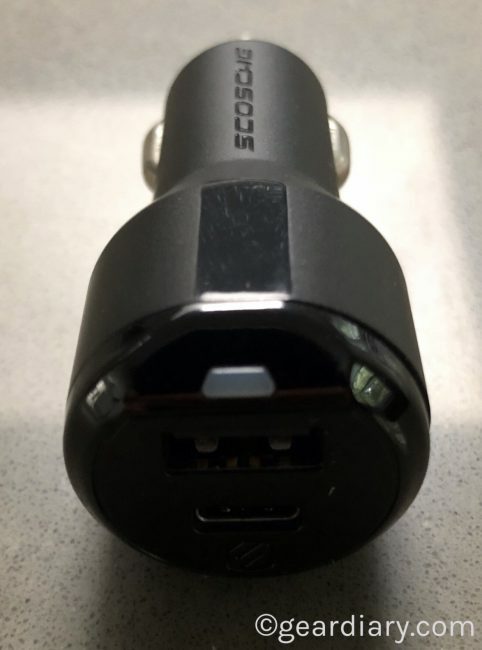 Scosche did, however, realize that USB-A is still a mainstay for many devices, so they also included a 12W USB-A charging port. If you have a loved one who has trouble cutting his or her own nails, whether because their hands shake too badly, they have arthritis and they can’t properly hold the clippers, their vision isn’t the greatest, or they just aren’t dexterous, you can give them the gift of self-care independence with the Clip Different Automatic Nail Clipper. This is such a cool product — you simply put your finger into the safe fingernail slot; it “prevents the skin from coming into contact with the trimming mechanism (even those with full vision loss can use it safely).” As an added bonus, all nail clippings are collected inside a tray — so no more shooting nail fragments across the room! Regularly priced at $149, you can preorder for fall 2018 delivery with free shipping for $119. If your loved one has complained that they enjoy listening to music without disturbing others, but they dislike bulky headphones or those tethered together in-ear headphones that bill themselves as “wireless”, then the $249 Earin M-2 would make the perfect gift. 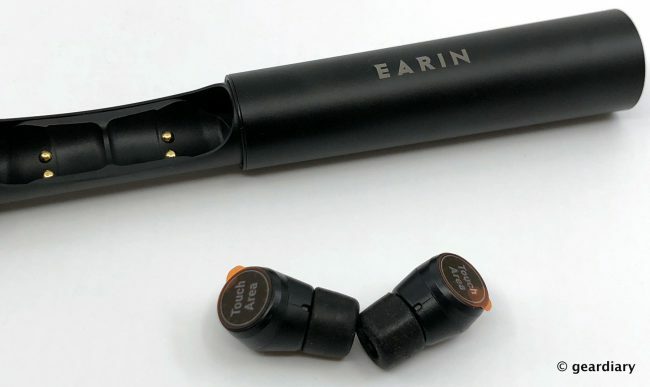 The Earin M-2 wireless earphones sound really good — much better than the Apple Airpods, and they don’t have an obnoxious stem that hangs down the side of your cheek. The aluminum storage case functions as a charger both at the desk and on the go. They’ll get up to 4 hours from a single charge, but the M-2s quickly recharge in their storage case to give the listener up to 14 hours total. I’ve got a pair, and people love to comment on how sleek they are. You can’t go wrong with these! 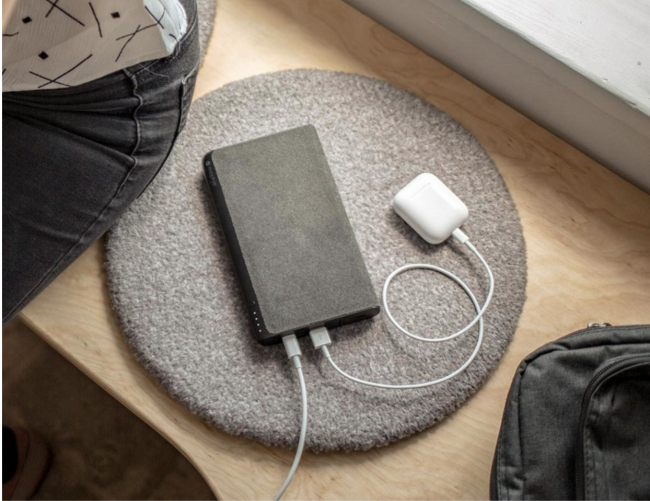 If you’ve always dread carrying around a micro-USB cable to charge up your battery pack on a trip, or you forget to bring just the lightning cable for your iPhone, you should really check out the $59.99 Boost Charge 10k Power Bank. 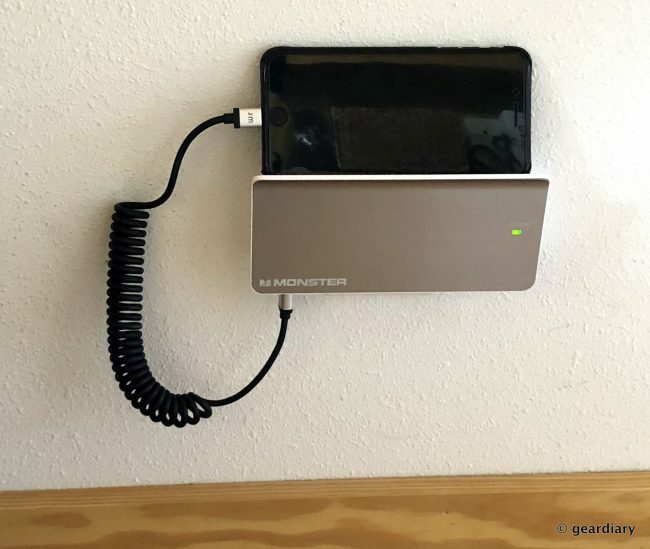 Not only does the battery pack have enough juice to charge up your iPhone or iPad, but the battery pack can even charge itself via lightning cable. The Boost charge is also available in a 2500mAh and 5000mAh model as well and is available in black or white. Have you ever looked at the bulky round “grab handles” people seem to increasingly have on the back of their phones and thought, “I like the idea, but that is way too bulky for me to ever consider putting one on my thin, light phone?” If so, you’ll be glad to know that Speck has a better mousetrap. The Speck GrabTab is a thin, card-sized accessory that adheres to your phone or case and provides a more secure way to hold your phone when on the go. It even doubles as a viewing stand when you need to go handsfree. At just 3mm thick, the GrabTab sits flat against your phone when not in use and then, with a quick flip of your finger on the flexible middle section of the accessory, creates a small loop into which you can place your finger. 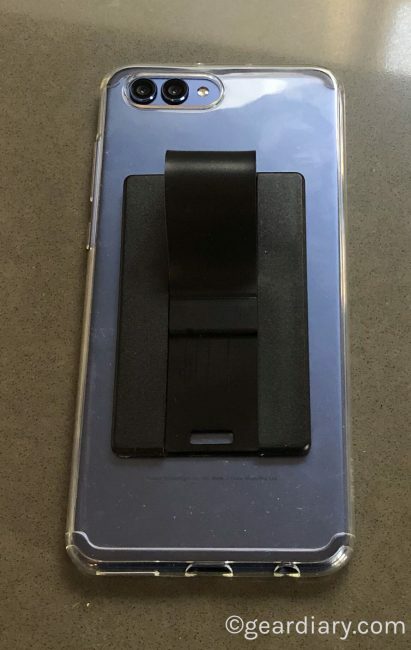 It is a great way to securely hold your phone when texting, taking selfies or simply avoiding your butterfingers that, all too often, result in your phone hitting the ground. If you have a techie in your life, they have likely been captivated by the smart home trend. The $129.99 Amazon Echo Spot has all the goodness of the Amazon Echo line but, thanks to its small size and vibrant screen, it can go anywhere to deliver all of the Echo goodness people have come to love. 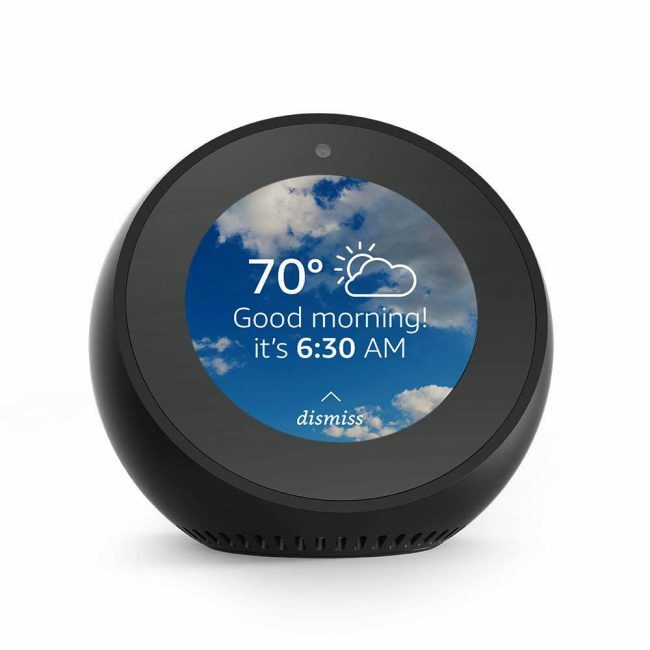 Best of all, it has a 2.5″ circular screen so it doubles as a clock, a voice and video call device, and it can operate all of your Alexa-connected smarthome devices. The Monster Power & Charging Station with Phone and Tablet Stand is the perfect gift for anyone who regularly finds themselves with a shortage of plugs. On the underside, there are three Type-A USB ports that are 4.8A with Rapid Charge on the left and four “Power Outlets with Monster FireProof MOV Technology” on the right. The $59.95 charging station offers 1080 Joules of Protection. It covers both plugs on a standard wall outlet, turning it into a full-featured charging area. Perfect for the kitchen or bedroom, you can even use the top as a phone or tablet stand. If you want to fill your home with wonderful scents but don’t want to burn candles, Moodo may be the way to go. 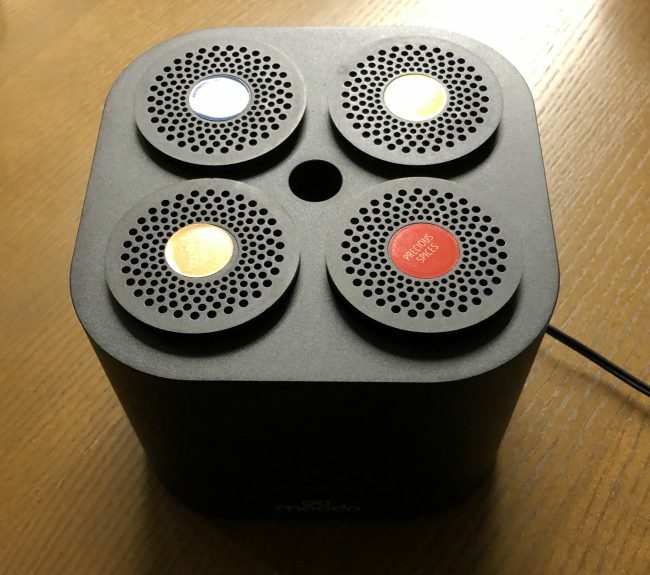 Moodo is described as the first smart-home fragrance system. The main unit has four spots on top into which you can place a variety of scented containers. (Containers come in packs of four, so you always have a scent “cartridge for each of the four slots.) Each one smells nice but the real magic begins when you start mixing various combinations of the fragrances. For example, one cartridge pack included Grandma Vanilla, Midnight Thrill, Precious Spices and Orange Sunrise. Each smells nice but the combination of two, three or even all four creates something unique. When Dan was testing the Moodo, his wife Raina came into his office and said, “MMMMM, what smells so nice?” That’s a ringing endorsement if we’ve ever heard one! The Moodo base is currently on sale for under $100, and the fragrance packs last up to two months are just under $30 on Amazon. Odds are you or a loved one will be getting a new phone, laptop or tablet this holiday season. The first question that needs to be asked after the box is torn open is, “How do I keep this beautiful piece of hardware safe?” Toastmade offers a variety of great solutions that look good, protect well, and don’t add too much weight or bulk to our ever-thinner devices. Dan recently reviewed one of Toastmade’s leather MacBook skins. 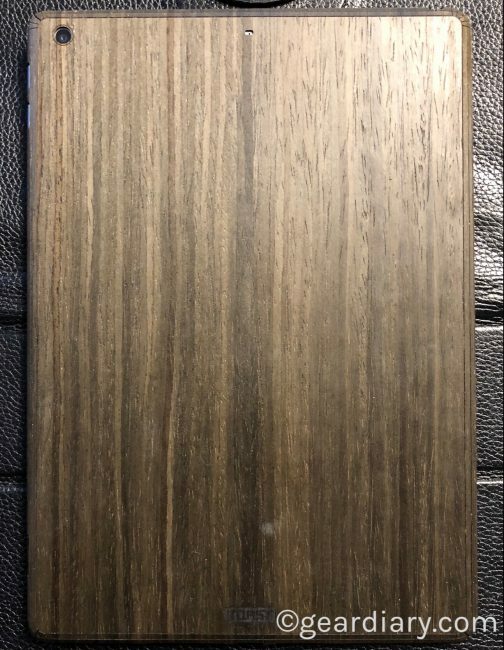 He also received a wood cover for the 2018 iPad he uses for work. The wood cover is beautiful, easy to install, and it does a great job of protecting the iPad’s back and sides. With prices starting as low as $39, there are a variety of styles and colors from which to choose. 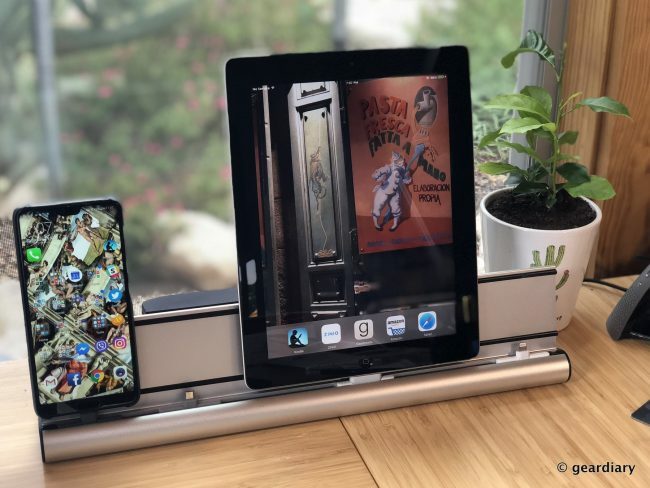 Whether it is an iPad mini, iPad 9.7”, iPad Pro and many other current mobile devices, Toastmade is a classy way to keep new devices looking and working great. You’ve never seen belt quite like those from KORE Essentials, and you’ve never worn a belt as comfortable as those from KORE Essentials. While most belts have a series of holes spaced one inch apart, KORE’s fashion belts take a different approach. 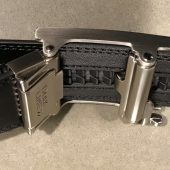 Rather than a series of holes into which one inserts part of the belt buckle to “lock” at the proper size, KORE’s belts have a series of plastic notches or “tracks” built into the back of the leather or nylon belt. 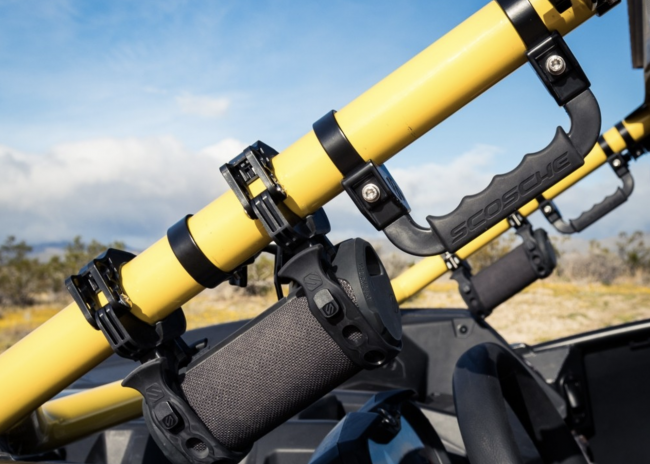 This, combined with special buckles designed to work with the track allows the belt to adjust to a huge number of sizes. In fact, thanks to this tracking mechanism, KORE belts have over forty different sizing points that are 1/4” apart. That makes them more than 800% more adjustable than the traditional belts I’ve always worn. It’s difficult to appreciate this approach without having a belt on hand but this video can help explain what KORE’s approach is all about. Perhaps best of all of the fact that all of KORE’s fashion belts work with all of the KORE fashion buckles. Buy two or three belts (the belts are one-size fits every waist size from 24” up to 44”) and a few buckles and you have countless combinations at hand. They will fit right, feel comfortable and match whatever outfit you happen to be wearing that day. A holiday gift favorite that everyone should have on their list is a reliable pressure cooker. 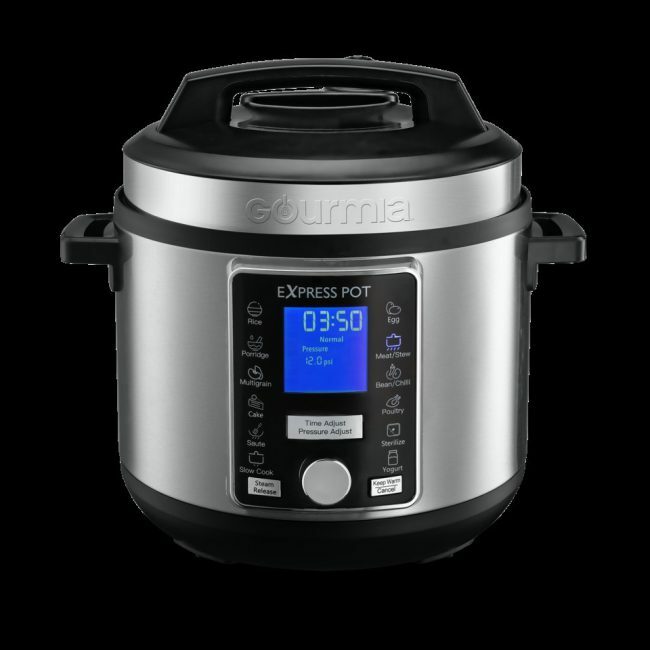 Some of the best meals come as a result of a good pressure cooker, and with its all in one, easy to clean design, the $199.99 ExpressPot by Gourmia goes the extra mile by including an Auto Pressure Release feature that immediately does what it says when cooking is done. But what’s even more innovative is the Auto-stir feature, so you no longer have to stand over your cooking food, checking periodically as that ExpressPot will not only automatically stir food without you having to open the pressure cooker. Available exclusively at Best Buy, this is certain to be a Black Friday fave. 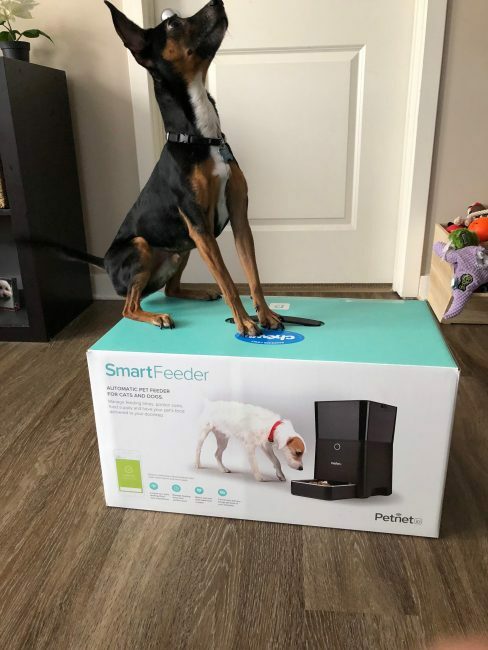 It’s not just us humans that have to eat though, and if you are one of those forgetful pet parents who occasionally forget when it’s feeding time, the $179 Petnet SmartFeeder is an automatic pet feeder that allows you to automatically schedule, as well as monitor, how your pet is fed daily. With an additional “SmartDelivery” service, when your favorite four-legged friend’s food gets low, the SmartFeeder will automatically order the food for you. What’s more, if you sign up for that service now, you’ll get three bags of your pet’s favorite food. You don’t have to be the greatest athlete to care about how you workout thanks to the $499.90 Polar Vantage V. A premium waterproof smartwatch, the Vantage V is GPS-enabled with an always-on color touchscreen display that will give everyone from athletes to the casual user who just wants their daily metrics to see things such as heart rate, workout duration, and pace. With bonus features like smart coaching and training features, you can gain insight with programs like Running Index, Running Program, Polar Sleep Plus, and Swim Metrics, all perfect ways to monitor your sessions on land or in the water. The Vantage V by Polar is a great way to track your health without the need for external sensors and gadgets. Chances are, you haven’t cleaned your phone in a while, and you’d be surprised of how filthy it could be, even with a quick wipe down. There are plenty of harmful germs you may not even see floating on your smart device, and PhoneSoap‘s third-generation sanitizing product not only will kill up to 99.9% of germs multiplying on your phone in under ten minutes, but it will charge it simultaneously. Available in seven colors, the PhoneSoap three is available in a variety of colors and will charge up to two devices. 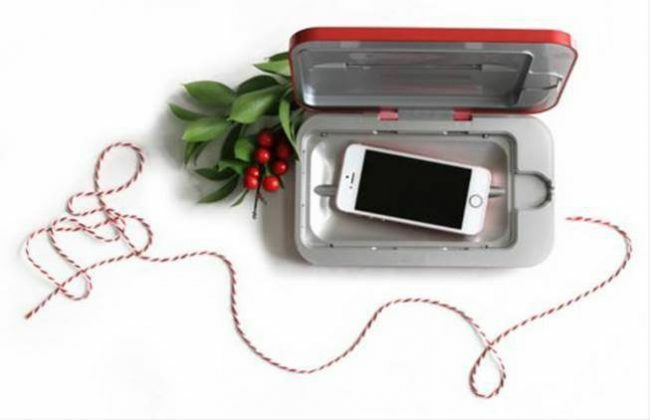 You can get this limited edition cranberry PhoneSoap this holiday season for $59.95. 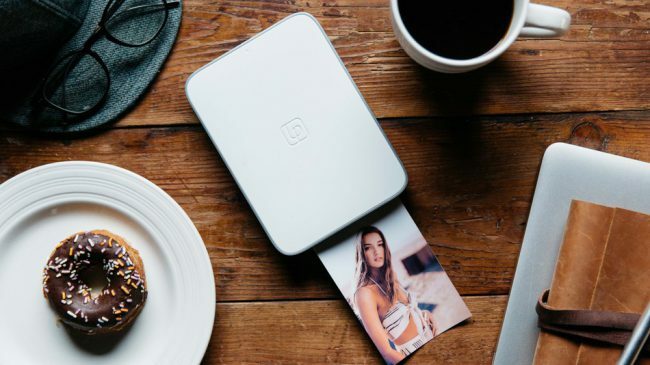 Truly a first of its kind, the $149.95 LifePrint is an augmented-reality photo printer that will allow you to print your favorite photos or videos from your iPhone and within the LifePrint app you’ll be able to watch your images come to life, thanks to the special ZINK film that comes included. Make your favorite media come to life, from either your camera roll, Facebook, Instagram, Snapchat or Twitter. The first ever in-garment joint support fitness gear that was created with medical technology that will prevent ankle rolls by up to 75%. Lasso Compression Socks are a runner’s best friend courtesy of sturdy fabrics that create pressure along the muscles around your ankle and ligaments. 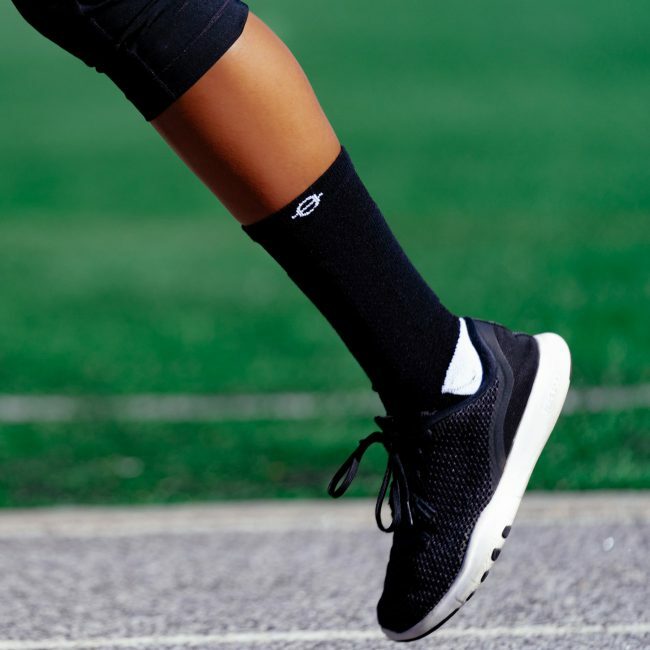 Gone are the days where you’ll feel as though those long painful runs caused you to blame your shoes, and it’s all thanks to the $29.99 Lasso Compression Socks. With an IP67 rated dust and waterproof build, the $129.99 BoomBottle MM is the do-all, hear-all Bluetooth Speaker that you need with you in your home or in your bag (or both!). With up to 12 hours of battery life, you can sit by the fire pit with friends this winter, or even have a host a holiday party indoors. The slim profile of the BoomBottle MM allows it to fit in water bottle cages and cup holders, so it’s perfect even on the go, but can also be attached to your jeans with the included carabiner. There’s even a magnet that lets you (carefully) attach your smartphone to mount it. Hey, pass the aux cord!! Chances are if you’re been int he car with family or friends, or intend to over the holidays, the $29.99 3.5mm Audio Cable by Belkin is the one device you may not think you need, but it’s worth its weight in gold. 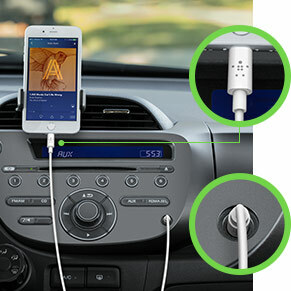 Not only does the cable allow you to carry around a single cable to connect your iPhone to your car speakers, but even at home on an external speaker, you can plug in your iPhone to the audio cable to get your favorite tunes played. For that special lady in your life, avoid getting her that perfume she has two bottles of alread, and get her something else you know she’ll put on every day — a pair of Bluetooth headphones. The $84.99 Helix LUX by Ashley Chloe is a truly wireless pair of headphones that come with Bluetooth 5.0. With hours of battery life, they are the perfect blend of fashion and technology that any woman would enjoy. It’s available in Black. Wireless charging is all the rage in 2018, and if you want to give the perfect gift to a family member, think of all the wires they may have lying around. Instead of giving them boring socks, you should give them the $69.99 Belkin Boost Up Wireless Charging Stand. 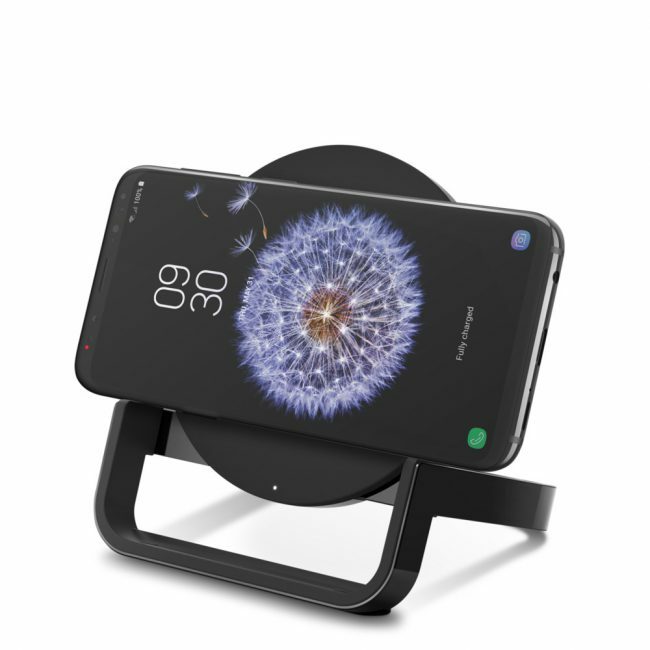 Available in white or black, the Boost Up is a great stand for ANY smart device that allows Qi-enabled wireless charging. What’s more, you can set your device in landscape or portrait, which is great for recipes, listening to music, or just charging up at work. For the forgettable friend, the $35 Tile Pro is the perfect stocking stuffer you give to someone special who tends to leave things behind. Not only can you track things like your keys, your bag or even your dog, with a Tile Pro subscription (available separately), you can even receive lifetime battery replacements for your Tiles so you don’t have to suffer from purchasing a new one every 365 days. ‘Tis the season to stop misplacing your essentials; gift a Tile Pro today! Mediation is possibly one of the best ways you can go about staying focus, and aligning your chakras, and Calm is the #1 app in the App Store that offers this. 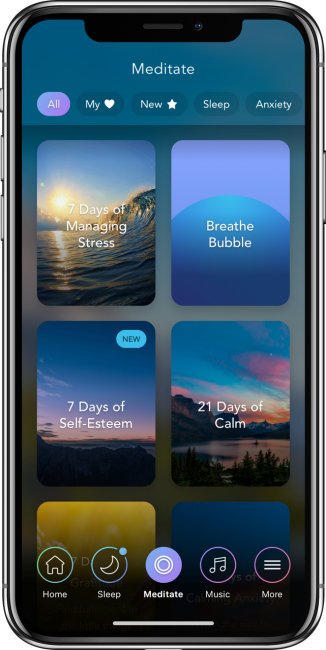 With over 100 hours of audio included guided meditations, calming music, it’s actually one of the more affordable meditation apps at only $60 a year. On top of that, it works for both Android and iOS. If you’re looking to secure your front door than it already is by adding the ability to monitor it directly from your smartphone, the $279 August Smart Lock Pro is one of the best ways of doing this. A retrofit smart lock that’s built to allow you to lock and unlock any door directly from your phone, will also give you peace of mind in terms of home security. 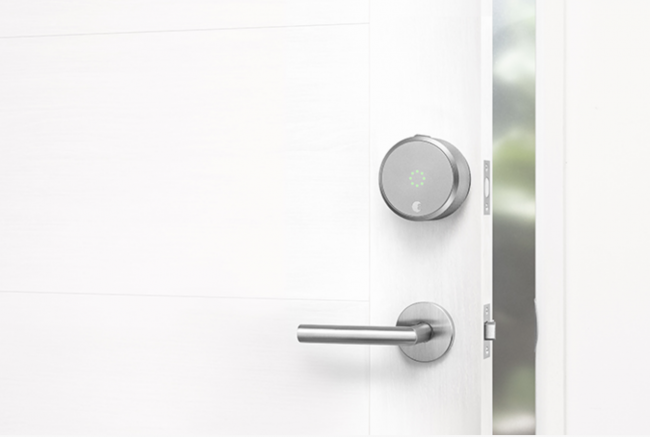 We’ve recently reviewed the August Smart Lock, and this particular model is fully integrated with Apple’s Homekit, as well as Amazon’s Alexa platform. 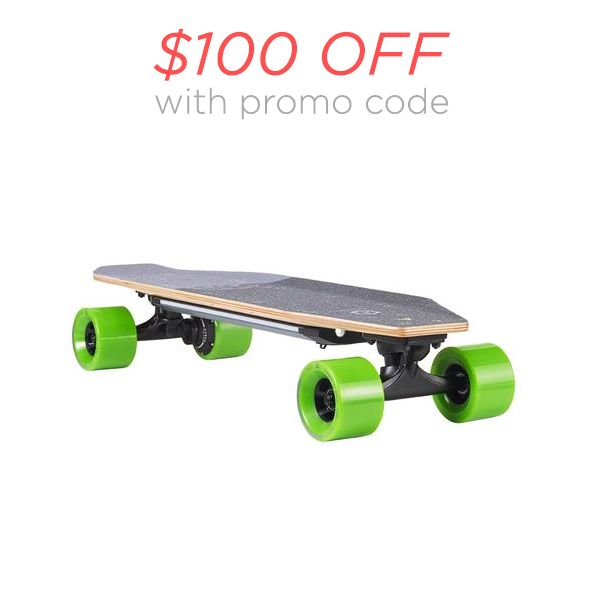 Get off the couch and get outside with the BLINK S-R electric skateboard from ACTON. You can take $100 off your purchase with the code BSR18 from now until Tuesday, December 25! 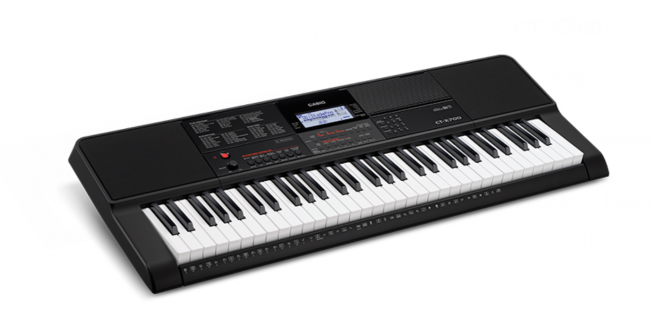 The retail sale price $349; full retail price is $449, and payment plans are available. Don’t forget your helmet and pads! 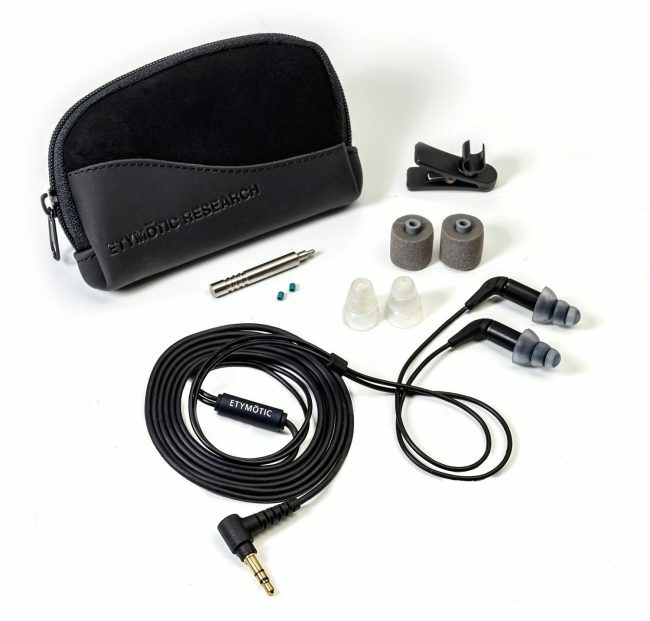 Want a set of totally immersive headphones for Audiophiles at a Fraction of the Cost? 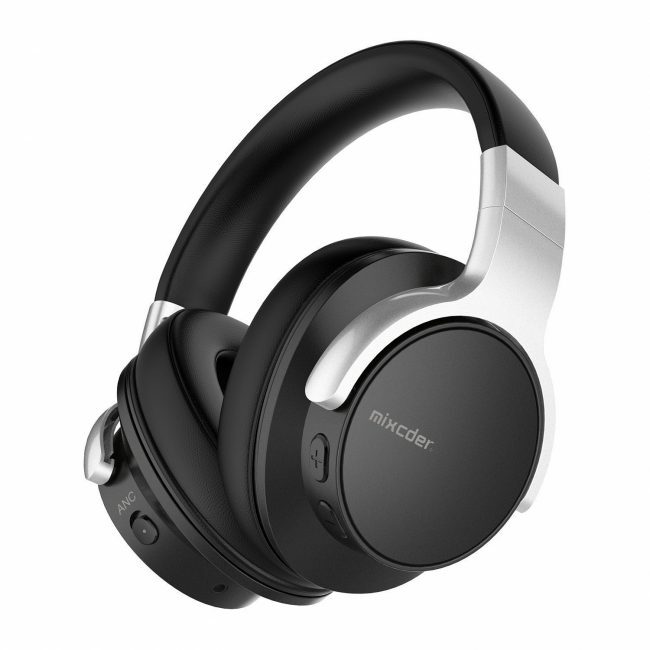 Check out the Mixcder E7 Active Noise Canceling Bluetooth over the ear Hi-Fi stereo headphones. They have deep bass and a built-in microphone which “deliver on the company’s mission to create premium noise canceling headphones at an affordable price for everyone – at only $59.99!” The Mixcder E7 have Active Noise Canceling (ANC) Technology that “continuously detects and reacts to outside noises, analyzing sound waves and blocking out ambient sound by creating inverse waves for a totally immersive experience for beautiful music and sound.” You can get them for $39.99 with the holiday discount that runs through December 25th. If you are shopping on Amazon, use code MIXCDER7; if you are shopping on the Mixcdr site, use code NBNQFFQZ. I’ve got a udoq 400 sitting on my desk, and it is no joke that it is the ultimate luxury docking/charging station for all mobile devices. 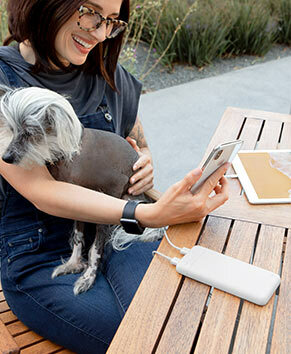 It doesn’t matter what brand or generation devices you need to charge, the udoq 400 Power for Apple and udoq 400 for Android are a “one-size-fits-all station for charging/docking up to five smartphones, tablets, music players, smartwatches, eReaders, and other devices.” Udoq was created by the “minimalist designers of Porsche according to German engineering standards”; it is “plug & play ready, made of elegant sturdy high-grade aluminum that’s built to las.” Arrange all your devices (and their cables!) quickly and neatly in one station without the mess and disorganization of tangled cables and lost devices. Prices range from $139.99 to $169.99, and you can get them directly from udoq. Dolby powers the technology that gives you sight and sound experiences that are incredibly vivid. While there are a large range of items that take advantage of Dolby tech, including the iPhone XS (which features Dolby Vision), Apple TV 4K (featuring Dolby Vision and Dolby Atmos), The Xbox X (featuring Dolby Vision and Dolby Atmos), the Xbox One S (featuring Dolby Vision and Dolby Atmos), and the Lenovo Legion Y730 Gaming Laptop (featuring Dolby Atmos speaker system with Dolby Radar) to name a few, I’m most excited about the new $599 Dolby Dimension Headphones. They offer cinematic sound, one-touch switching between devices, and Dolby LifeMix which “lets you control how much you hear of your surroundings, from a perfect blend of your entertainment and life around you (Transparency) to shutting out the world (Active Noise Cancellation).” Dolby says that using them will make every screen sound like the big screen. The Dolby Dimension headphones use a wireless Power Base for charging which keeps the headphones on display and within reach. It takes about 2 hours to fully charge the headphones, but if you’ve forgotten to charge them,, just 15 minutes on the Power Base will give you enough charge to watch a movie. There’s also an included microUSB cable for times when you need to charge on the go. Watch the video, and tell me what you think! The $179 Tap Wearable gives “touch typing” a whole new meaning! If you are looking for an exciting new, ergonomic and portable way to type, the Tap Wearable keyboard & mouse is perfect. Tap consists of a series of rings worn over the thumb and fingers that register your hand movements, letting you type and control a cursor on nearly any surface, including your own body! It connects via Bluetooth and is compatible with nearly every major operating system. It works great as a game controller too! Right now they are doing free worldwide shipping too. 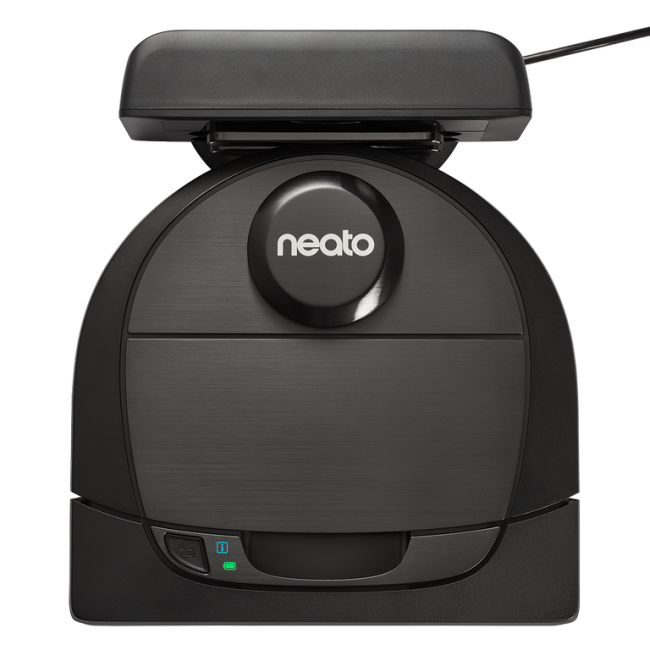 For the holidays, you can give the gift of not having to clean by purchasing the Neato D6 Robot Vacuum. A robot that will certainly pick up shedding pet hair, as well as those crumbs and dust particles that you may or may not have missed when you attempted cleaning on your own. Featuring quick boost charging, and virtual no-go lines, the Neato D6 Connected comes with a companion app that allows users to control which portions of their houses to clean. At $699, it’s one of the more affordable, yet best robot vacuums on the market.